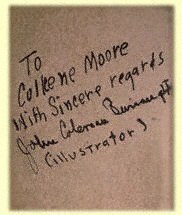 Colleen Moore's position as one of the most popular actresses in Hollywood gave her the resources to produce a "Fairy Castle" of fantastic proportions. 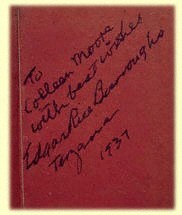 Beginning in 1926, Moore enlisted the help of many talented professionals to help her realize her vision. 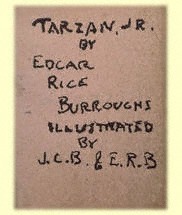 In 1937 she asked ERB for a few words from a Tarzan book and an autograph to add to her miniature Fairy Castle Collection at The Museum of Science and Industry in Chicago. 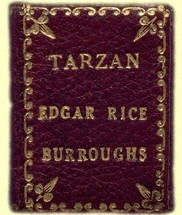 What was returned to her was an original fable featuring a princess and Tarzan, Jr. written by ERB and illustrated by ERB and John Coleman Burroughs. 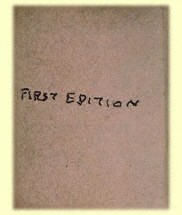 The unusual thing about this story is that it was printed, by hand, in a one-of-a-kind, one inch by one inch, miniature book. 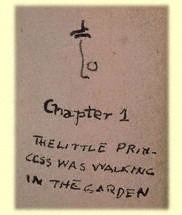 ILLUSTRATED BY J.C.B & E.R.B. include about everything it's fun doing. Think what a good time you could have." 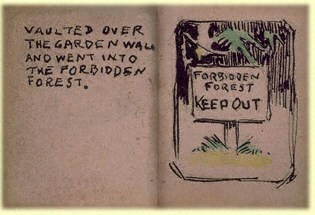 vaulted over the garden wall and went into the forbidden forest. 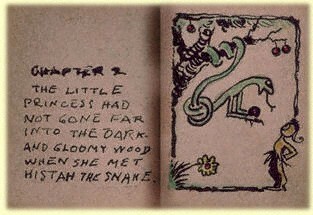 The little princess had not gone far into the dark and gloomy wood when she met Histah the snake. 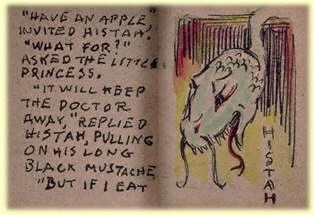 ILLUSTRATION: FACE OF A SNAKE WITH WORD "HISTAH"
it, I may need the doctor," countered the little princess with her left. "Ah, ha! Foiled again," hissed Histah. 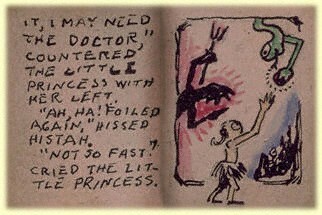 "Not so fast," cried the little princess. 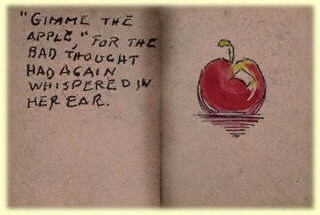 "Gimme the apple," for the bad thought had again whispered in her ear. barged up and took it away from her, "Beat it!" he trumpeted at Histah. Then he ate the apple himself. "What have you in that shoe box?" he asked. 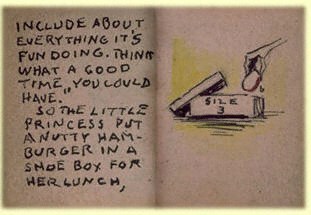 "Nutty," replied the little princess. 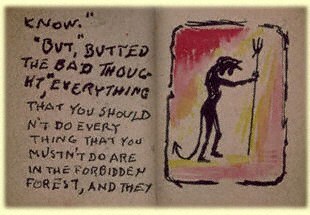 ILLUSTRATION: SIGN POINTING: "NEXT PAGE"
and ate that too. Then he went away from there into the land of ptomaine. ILLUSTRATION (B&W): ELEPHANT'S HIND QUARTERS ENTITLED: "TANTOR GOING"
eating the little princess. 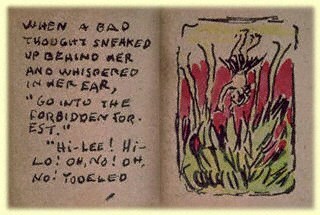 With a terrific roar, he leaped for her. bronzed giant, naked but for a G string, drop from an overhanging branch full upon the tawny back of the carnivore. 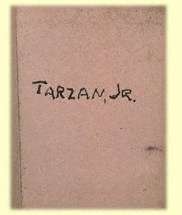 It was Tarzan Jr.! Jungle placed a foot upon the carcass of his kill, raised his face to the heavens, and voiced the victory cry of the bull ape. have an apple in your pocket." 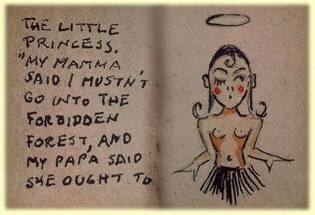 "I haven't any pocket," admitted Tarzan Jr.
"All right then," said the little princess. "Let's skip it." 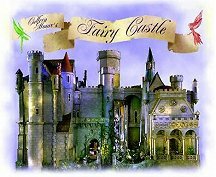 ever after - and that is what the little princess got for disobeying her mama and going into the Forbidden Forest. ILLUSTRATION: "KEEP OUT" WITH A RED X OVER THE SIGN.